Every woman wears a lot of hats…and carries a lot of bags. At one point in your life, you’ve probably carried a diaper bag, suitcase, purse, gym bag or school bag. In fact, you’ve probably carried multiple around at one time. If you’re like me, then you can never have enough bags…or shoes…or lip gloss for that matter. But it’s not just the bag that’s important, but what goes in the bag that helps fuels our day. So what are these ultimate bag essentials that today’s modern woman needs to be successful? No matter what time of year it is, the modern woman always needs a pair of sunglasses on hand. Even during the holidays, you don’t want to get caught driving without glasses when the sun hits those snow banks! I tend to lose my sunglasses in my bags or worse yet, break them. So not only do I recommend a pair to keep in your bag at all times, but perhaps even more important is a sunglass case, like this Vera Bradley double sunglass case. In addition to having a dedicated pair of sunglasses for my everyday bag, I also have a pair of earbuds that stay in it too. The Polaroid Bluetooth Earbuds aren’t just compact, but they also allow you to be untethered from your favorite device. This makes them great for listening to a podcast while driving or listening to your favorite workout mix at the gym. In addition to being on sale for $29.99, you can also get another 10% off right now with code GIVE. At some point during the day, you’re going to want a little pick me up and nothing does that quite like a quick spritz of perfume. Carrying a travel-size spray bottle of your favorite scent makes sure you never have to head home to freshen up and is the perfect size for plane travel as well. One set I love in particular is the Juicy Couture 3-Pc. Viva La Juicy Coffret Gift Set; not only does it have a travel spray and solid perfume pencil, but it also comes with a Juicy Couture lip gloss. Speaking of lip gloss, every girl needs at least one in her purse at all times…but I suggest having more than one. I always like to have something in my ultimate bag that’s sheer and moisturizing and another lip gloss with a little more color and pigment. So if you don’t option for the Juicy Couture set above, think about trying this new MAC Mariah Carey Lip Glass with just the perfect amount of shimmer for the holidays. I can’t tell you how many times I pledge to wake up early enough to get completely ready for my day, but then I end up rolling out of bed just in time to get the kids to school…and of course those are the days I end up having to go into the office or run into someone that wants to talk to me. 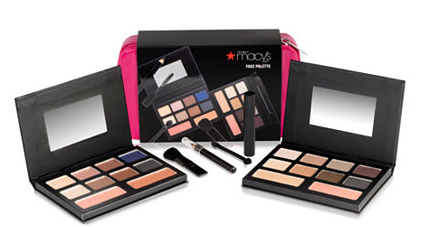 For those reasons – and many more – I love always having an all-in-one makeup palette on hand, like the Macy’s Face Palette. That way, no matter what state I leave the house in, I can always throw on some bronzer, eye color, mascara and blush to brighten my face. It is also is a great tool for mid-day makeup touch-ups. Even in our era of smartphones and iPads, I never go anywhere without good ole pen and paper. But not just any pen and paper will do for me: I need a pretty notebook to track my thoughts in and a blue pen to write them down. These beauties help with everything from reminders and appointments to great quotes and grocery lists. It goes without saying that everyone needs a wallet in their list of ultimate bag essentials, but not just any wallet…a power clutch. And I’m not talking about a power clutch like a “power lunch” – no ma’am. I’m talking about a handy clutch that you can take out of your bag to run into the grocery store, but that also can charge your phone (hence the “power”). I’ve never seen these for less than $99, but Macy’s has the Dopp Portfolio Clutch with Power Bank for just $65 right now. So there you have it: the 7 ultimate bag essentials for today’s modern woman. I’m sure you have your own bag essentials, like gum, wet wipes or even a big puffy keychain, but that doesn’t matter as much as this: make sure you have a dedicated set of whatever you need that stays in your bag at all times. That way you’re always prepared no matter what life throws your way!